If you knew me through my blog and not personally, you probably thought nail polishes are the only things that makes me happy. Yes, I'm happy whenever I receive new polishes or when I create a new set of nail art. However, what gets my heart pounding are books. My love for books and reading began when I was a kid and I've amassed a collection of more than three hundred books over the years. A novel generally costs S$18 on average; multiply that by three hundred and that meant I've spent nearly S$5,400 on books alone. And that's not including the number of magazines which I had sent to the recycling centre. Friends are always horrified when they find out about my books collection and the common remarks that I get is, "Why don't you borrow from the library instead?" or "You can travel with that amount of money spent!" They are not wrong, but I love the smell of a new book and the feeling of my fingers flipping through the pages. I love to read at my own pace and borrowing from the library meant I have to finish before the due date and I do not like to read in a rush. And if everyone were to borrow from the library and not purchase any books, soon, all the book stores will have to shut down. As it is now, there are already very few book stores around. Friends have also suggested that I go into e-books instead and I've tried but I still very much prefer the real thing. 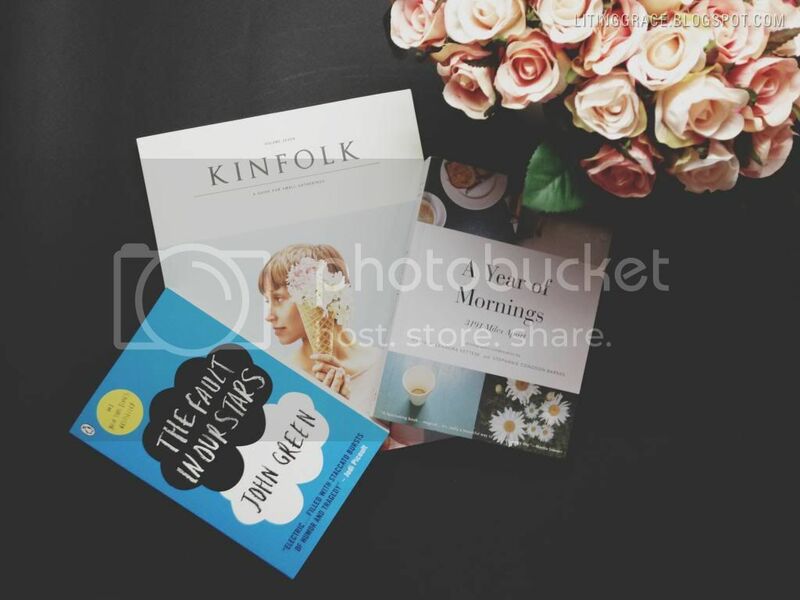 Happy or unhappy times, my books have been my constant companions. They have brought me laughter, tears and taught me lessons. The genre of books that I read have also changed over the years. I used to read only fiction and chick-lits but have now ventured into mystery, investigative, inspiration and photography. 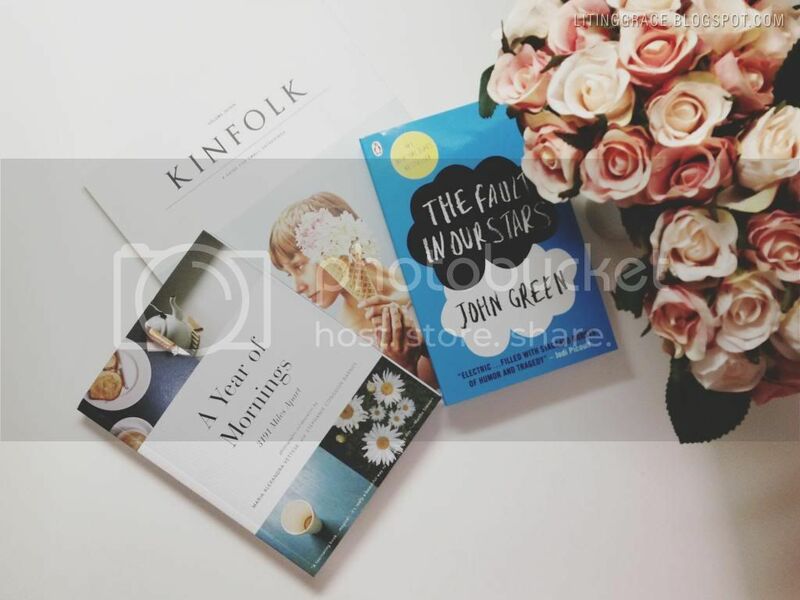 I finally laid my hands on "The Fault In Our Stars" by John Green, an author who's new on my reading list; the latest issue of "Kinfolk" and "A Year of Mornings" by Maria Alexandr Vettese and Stephanie Congdon Barnes. "A Year of Mornings" has been on the top of my booklist and I was really happy to find it at the Ngee Ann City branch of Kinokuniya. It came with hefty price tag of S$36.36 but thanks to the Members Sale, I paid only S$29.08. I've flipped through the book briefly and man, I've fallen in love with the beautiful photos. Do any of you love reading and which author or books do you recommend? Feel free to leave me a comment or if you are shy, you may drop me an email at hung.grace@gmail.com.